A fully-functional, portable CD/DVD (Blu-Ray, HD-DVD) Burning Software. At this moment the project is working on StarBurn SDK, but will possibly include other Free SDK or even writing new hardware-working layer. 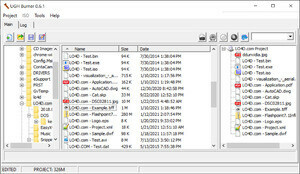 Explorer control rebuilds automatically on directory/file structure change of the current directory. For security reasons, you should also check out the UGH Burner download at LO4D.com which includes virus and malware tests. Additional screenshots of this application download may be available, too. UGH Burner download been highly rated by our users.